The time has come for residents to have their say on what Keynsham's new clock tower should look like and who will get to create it. Three very different designs from the shortlisted artists were revealed at the end of April with an exhibition held at Pomegranate Cafe on Temple Street. Voting on the proposals will open on May 9, both online via Facebook and with a paper ballot. Councillor Paul Crossley (Lib Dem, Southdown), leader of Bath & North East Somerset Council, said: “Following the public vote by the people of Keynsham, the clock tower will be in situ by April 2015. This month the display is moving to Keynsham Town Council’s offices in Temple Street before going to the Key Centre at Keynsham Methodist Church. The Arts Advisory Group, which was responsible for creating the brief for artists and then whittling the designs down to three, say the ideas on show are at an early stage and the successful artist will work with the community to draw up a final piece. 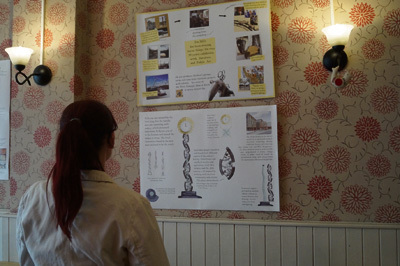 Metalworker and children’s book author Jon Mills has drawn on the legend of St Keyne turning snakes into ammonites, with a stone plinth in the shape of an ammonite and snake-like twisting columns featuring panels depicting aspects of the town’s history making up the column. The clock itself is in a sunburst design, using the same alloys as the cladding on the new buildings, and is backlit with LEDs that will slowly change colour. Sculptor Sebastien Boyesen’s design features a multi-coloured or “patchwork” structure made of toughened glass encased in resin, through which passers-by will be able to see cogs, gears and a water wheel in action, representing the area’s industrial heritage and the importance of water power. Images and text would appear on the mechanisms, telling the town’s story, with the patchwork and stained glass references linking to ways history has been recorded in the past. Clock manufacturer Smith of Derby says its vision is for an iconic, practical landmark and has drawn up a proposal for three mirrored columns of different heights, each with a full moon illuminated clockface. The panels would be etched and the manufacturer says the time capsule set to be buried under the development could go beneath the glass panel at the centre of the structure. The Key Centre at Keynsham Methodist Church, Charlton Road from May 9 to 15 (open 10am to 5pm with a late night on Friday, May 9, until 7pm – note the Key Centre is not open on Sunday). There will also be a talk by the artists on Friday, May 9, at the Key Centre, Charlton Road, Keynsham, with further details to be announced. Voting will take place online on Facebook by searching for the page KeynshamClocktower, and by ballot at the Key Centre. Voting closes on May 15. Facebook users are being asked to go online and “Like” the KeynshamClocktower page so it goes public.